Country Ready for an Independent? Dem. Colorado Gov. 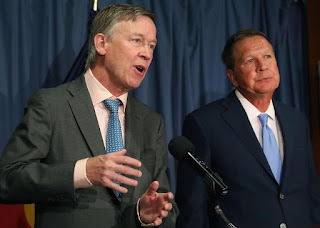 John Hickenlooper and Rep. Ohio Gov. John Kasich and John Hickenlooper have mused the moment might be right for an independent ticket for president and vice president. Of course, they offer the usual denials that they are not serious, but they do have several things working for them. Both parties delivered their nominations to very unattractive candidates leaving huge swaths of voters making their least unfavorable choice. Donald Trump’s insurgent takeover of the Republican Party and Bernie Sanders nearly capturing the Democratic nomination shows how vulnerable the parties are to movements and ideas outside their respective establishments and orthodoxies. Considering 2020, the Republican Party remains fractured by Trump’s self-regard and character flaws as much as any policy differences. But the Democrats continue to appear befuddled locating an attractive governing philosophy beyond opposing Trump, a strategy that did serve them sufficiently in 2016. But as weak as the parties have become, the opening for a bipartisan team of two moderate governors to run as independents is still very narrow. America’s two-party system still represents at least 60 percent of the electorate and voters tend to remain loyal. Trump would have a 25 percent approval rating from his core supporters if regular Republicans weren’t still on board. And, although he eked out his thin victory with the white working class in several states, in fact, he carried upwards of 90 percent of rank and file Republicans. But beyond voter loyalty to overcome, the parties have embedded themselves in state statutes, making ballot access and conducting third-party campaigns very onerous. Massive amounts of money will be needed to get on the ballot in most states and to run a campaign. Neither Kasich nor Hickenlooper are rich or such high-profile celebrities to get around the $1 billion minimum that appears to be required to both promote a candidacy and to defend against the inevitable attacks. Hickenlooper, in particular, will be considered by Democrats as a spoiler. The Party is convinced Trump is likely a one-termer and will not want a moderate independent/Democrat in the field that could siphon Democratic votes from the ticket. This appears to be a moment the public is interested in politicians who lower the drama and extreme partisanship to get things done. But, the centrist approach that often wins for state executives may not motivate the wider reaches of national party voters or even independents. The good news for the two of them is that the moment appears right to offer some can-do bipartisanship. All the legacy media is ready for a contrast to Trump, the Freedom Caucus, Nancy Pelosi and Bernie Sanders. At a minimum, Kasich and Hickenlooper should have fun ride on the talk shows. So all those denials are really confirmations? Ciruli said the fact that this ticket is being talked about at all reflects the political moment we’re in, one where both parties produced candidates that were broadly unpopular in the last general election and there is widespread disgust with gridlock in Congress and intense partisanship. “It’s the best alternative theme out there,” he said. If nothing else, this speculation raises the profile of the governors’ brands. President Trump doesn’t make it easy for the majority of Americans to support his direction on North Korea. The bottom line is that more than half the public (59%) is uneasy about Trump’s “ability to handle the North Korean nuclear situation” (CBS News poll, Aug. 14-16, 2017). And, of course, more than half the public (56%, RealClearPolitics average) disapprove of President Trump’s presidency as of mid-August and only 38 percent approve. 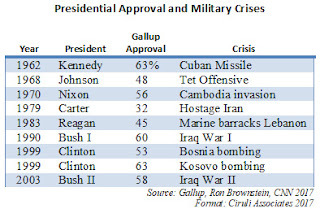 He would be the weakest president in terms of approval at the start of a crisis involving military action since Carter (32% approval) in 1979 at the beginning of the Iranian hostage crisis. Trump has the advantage that most Americans rate North Korea as a serious threat, and know that previous diplomatic efforts have failed. But, Trump has to construct support for his approach from a very skeptical public. Although European establishment politicians hold power in France, Germany and Great Britain, they are struggling with leading the change the era and major segments of the public demand. Prime Minister Theresa May was to bring a firm hand to the Brexit process, but lost an election to strengthen her majority and now only has the approval of a third of the public. She faces an unhappy right, an energized left and ever threatening secession sentiments. President Emmanuel Macron swept into office extoling the EU and internationalism, while crushing the far right. But he shares with May the approval of only a third of the public. Budget cuts required by EU rules have alienated his military and his own style, criticized as imperial, has taken a toll. Chancellor Angela Merkel continues to lead the Western leaders with more than half of the public’s support. She will likely win re-election. But, her approval has fluctuated and dropped recently as her re-election campaign deals with criticism from the left. President Vladimir Putin’s 2018 election is in the bag, but he works public opinion like a pro, with a sophisticated propaganda machine, aggressive restraint of opposition and use of foreign policy for fueling nationalistic sentiment. He lets his prime minister take the blame for any weaknesses in domestic policy. His approval rating is in the 80s. Medvedev’s is usually well below the 50s. President Donald Trump has been in office about 220 days, won office with 46 percent of the public and has never moved above that figure. Today, his approval is often measured below 40 percent. The politics of the era of disruption is driven by the deep loss of trust in the government and major institutions, including national parties and its leaders, and the broad polarization among significant segments of the public, reinforced by the new technologies of communication; i.e., cable news, social media. If you prefer a liberal democratic order and a free market, don’t expect it to survive without leaders and a public ready to fight for it. Donald Trump has declared war on the Republican Senate establishment. It started with a testy exchange between Trump and Senator Mitch McConnell after the defeat of the health care bill. Trump ramped it up with a series of tweets implying that McConnell was a failed leader and that Senate Republicans were negligent for not staying in D.C. and passing one of the Republican-led bills. Trump has taken on a number of individual Republican senators who have criticized him during various August controversies. He added fuel to the fire at the recent Arizona rally with attacks on Senators McCain and Flake, including encouraging a primary against Senator Flake. Trump hasn’t spared Republicans in the House. Recent tweets have criticized the House leadership on the debt ceiling. He has called for a shutdown of government if his wall along the Mexican border isn’t funded in the upcoming budget bill. The result of the war between the executive branch and Republicans in Congress will damage the Republican brand and cause a schism between Trump supporters and the Republican establishment, including more traditional Republican voters. Although it will be hard for Republicans to lose the Senate due to the number of vulnerable Democrats up in 2018, the Republican House and its 24-seat majority is up for grabs. Although President Trump wins a head-to-head contest in the polls with Senator McConnell and Congress – mainly because Congress rates so poorly among the public – it’s a self-defeating victory because it likely undermines any chance for tax reform or infrastructure legislation this year, or even in this session. Trump, no doubt, considers his attacks a warning to Republicans that he will retaliate against any criticism. And, given that he’s most concerned about his brand and already beginning his 2020 campaign, separating from Congress and the health care loss may offer some personal protection. But it damages the Republican Party and highlights the failure of party control and his leadership to relieve gridlock. Trump appears to be running on his own and against Congress. Will Republicans in Congress now begin to go their own way? This is new political territory. It’s a guess how it changes the 2018 election. 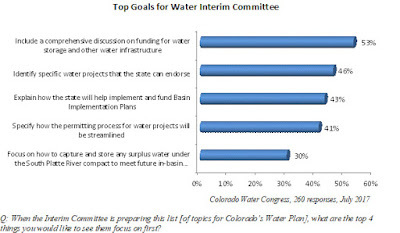 Colorado Water Congress (CWC) members in responding to an online poll conducted this July said the main topics for the “Interim Committee to focus on first” are funding, identifying and permitting water projects and other water infrastructure. The survey was conducted to assist the CWC identify its communication and policy priorities. 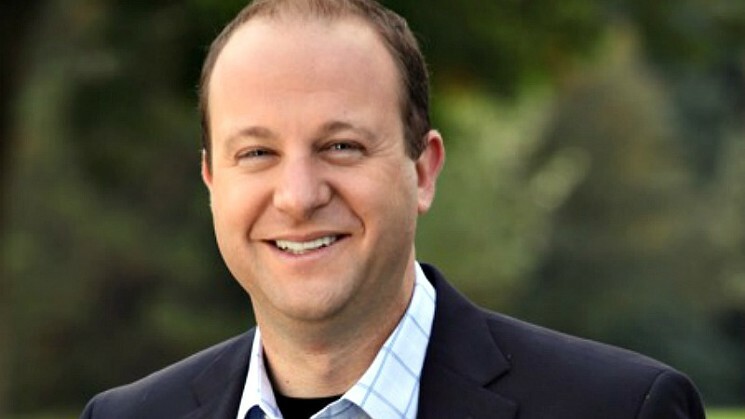 Will Polis Join the Ranks of Wealthy Governors? Wealthy Running for Governor. Louis Jacobson, a political writer for Governing Magazine and co-author of the Almanac of American Politics (2018 edition, due out in a few weeks), writes that billionaires and millionaires are winning the nation’s governorships, but are losing on governing. Jacobson counts nine billionaire or millionaire governors and more coming, including Jared Polis. Read Louis Jacobson’s article, These Governors Are Rich, But Are They Effective? 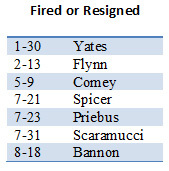 The only people left from the team pictured on January 28, 2017 are the two that can’t be fired. Will Mr. Bannon’s removal make much of a difference? It’s better for General Kelly and it lowers internal conflict for the national security and economic and domestic policy teams, but Donald. J. Trump is still the master of provoking and improv. Expect more. Donald Trump likes to live on the edge. He still has his base, but the broad reach of the country’s leadership community, from small towns to the big cities, are beginning to believe that, regardless of their preferences for many of his policies, Trump is not suited to the job. His failure to move the big agenda, combined with the constant controversies, mostly self-created, highlight his greatest weakness – the character issue. As opposed to a parliamentary system where if a leader loses his or her majority, he must stand down. America’s elections are regularly scheduled. 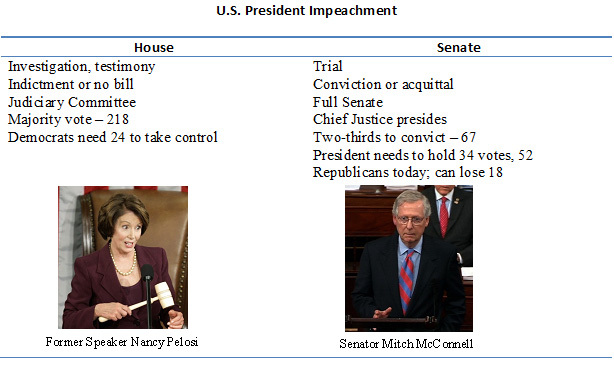 But if Republicans lose their House majority, impeachment is possible. Most likely, the Democratic Party would prefer to just end his term at four years in 2020, but his actions or political pressure may start the process. A bill of impeachment, an indictment, would start in the House and most likely use whatever investigative materials had been gathered up to that point. The Judiciary Committee is the usual committee of jurisdiction (today, the ranking Democrat is Rep. John Conyers of Michigan) and would likely conduct any final investigations and hold public hearings. A majority vote of those present and voting can get the impeachment bill out of the committee and then through the House. The Senate, of course, is Trump’s firewall. It is unlikely Democrats will take control in 2018, and even if they did, it requires a two-thirds majority, or 67 votes, to convict. As of today, it seems unlikely a Barry Goldwater scene will ensue as in 1974 when he led a Republican delegation to the White House to tell President Nixon he didn’t believe there were 15 Republican votes to stop a conviction in the Senate. It was assumed the House would vote to indict. Goldwater also made the case that the country should not have to go through the ordeal of trial and conviction. If this scenario played out today, the House action would start in 2019, just as both parties start the prep for the 2020 general election, a trial could follow in the Senate. Would Republicans move to dump Trump? Could they succeed or does his base hold? Will he have 34 Senate votes in two years? This seems like a far-fetched scenario today, but it makes for interesting speculations. Republican control of the U.S. Senate could be up for grabs in the West. Arizona Senator Jeff Flake, the scourge of Donald Trump, and Nevada Senator Dean Heller, the waiving vote on health care (he finally voted yes), are in the two most vulnerable Republican seats in the country. Both Flake and Heller face possible primaries from Trump supporters and very tough re-elections in states Trump just barely won (Arizona) or lost to Hillary Clinton (Nevada). Democrats have vulnerabilities in Montana trying to re-elect Senator Jon Tester in a state Trump won by 21 points and hanging on to North Dakota is first-term Democrat Heidi Heitkamp. She won with only a 2,900-vote margin while Trump took the state with 123,000 votes. Democrats are hoping to win both Republican seats and hold their two, but winning the Senate will be difficult. 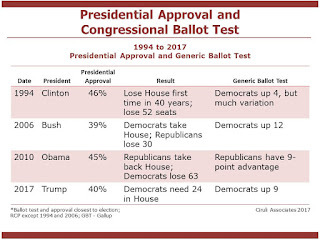 But for a Republican disaster due to Trump’s 38 percent and declining approval rating, Democrats should lose, not pick up ground in 2018 Senate elections because they are defending so many seats, several of which, like Tester and Heitkamp, are in Trump country (e.g., Indiana, Missouri and West Virginia). The nation’s top media organizations are not pulling back on polling. They are intensifying their efforts with more polling, new methods and more analysis. The Donald Trump presidency, the rise of populism, the surge of nationalism, the realignment of parties and collapse of the political center has increased public interest and viewers and subscribers. Pollsters are making some shifts in vendors and adding new methods. Their general goal is to gather more data with more varied methods – phone (landline and cell), online, probability, non-probability. The answer to the charge of “fake polls” is not less, but better and more. As CBS polling director Anthony Salvanto said, “There’s an interest in what people are thinking. We believe people want to understand how public opinion is shifting in these times.” Hang on, 2017 and 2018 will be very big polling years. Both on purpose, but also as a natural product of his viewpoint, Donald Trump works his base in the Republican Party and alt-right using politically incorrect and anti-establishment rhetoric every day. He provides constant fuel for his partisan and populist supporters. On average, Trump is holding about two-fifths of the public’s approval. Triangulating recent polls (Fox, CNN and Gallup), he receives about 85 to 80 percent of Republicans, 35 to 30 percent of self-identified independents and less than 10 percent of Democrats. The following chart shows where he receives his 40 percent of support. When he has slipped below 40 percent in the average, and he most recently slid to 38 percent in RealClearPolitics.com, it is mostly a reflection of small fall-offs (2 to 3 points) in each group. In addition, the percentage of Republicans has fallen in many surveys, with corresponding increases in Democrats and Independent identifiers. A month into Trump’s presidency, he had 88 percent of Republicans, 36 percent of Independents, and for a short time, 10 percent of Democrats. Today, with his 38 percent, he has 82 percent of Republicans, 30 percent of Independents and only 7 percent of Democrats. Unfortunately, voters in King County, home of Seattle, just rejected the multi-year effort to create a tenth of a cent cultural taxing district. The election, held August 1, lost by 2 percentage points, 51 percent to 49 percent, 9,000 votes out of 400,000 cast. Advocates knew that after the May 1, 2017 King County Council vote they had some challenges for the August 1 election. The County Council was divided with bipartisan opposition. The most powerful paper, The Seattle Times, did not favor it. But, they organized a strong campaign with nearly $2 million in funding, TV advertising and many local endorsements. In the end, the local tax environment was too much to overcome. The Seattle area sales tax has been increased repeatedly and is now above 10 percent. It’s often referred to as a regressive tax. There are a host of other issues the Times and others wanted addressed, such as homelessness, affordable housing and opioids. Arts funding was seen as a lower priority. It is a reminder of how special Denver’s SCFD is and serves as a challenge to Denver’s cultural and civic leaders to nurture and protect it. The public claims it supports a bipartisan approach to health care legislation now being attempted by a group of independent-minded congresspersons. Seventy-seven percent of Americans tell CNN pollsters that “Republicans should work with Democrats to pass a health care bill.” Only twelve percent said go it alone. 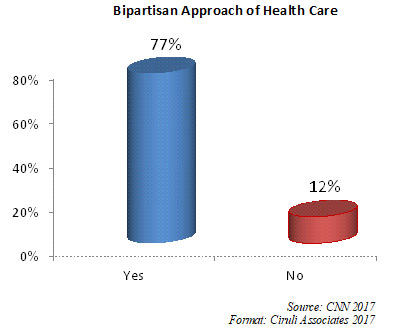 In fact, sixty-nine percent of Republicans said go with bipartisan approach. A bipartisan coalition of the House of Representatives has proffered a plan to stabilize the Obamacare markets to ensure the ACA doesn’t just collapse. This bill has a number of significant elements, but it faces a leadership in both parties that must deal with members committed to completely repeal on the right to single-payer on the left. 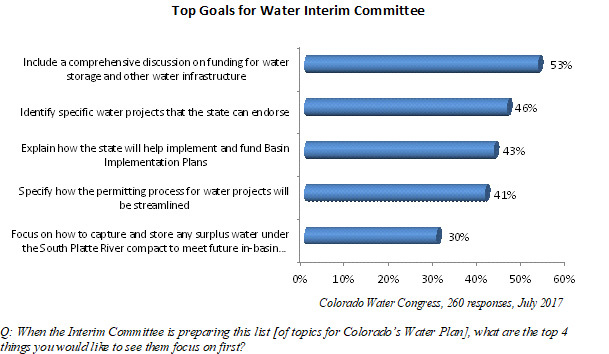 In Colorado, Representatives Coffman and Polis have been listed as members. Donald Trump early on liked military officers. They are now the most prominent feature of the administration. His attraction is partially based on military officers being mostly non-partisan, very professional and tending to support the commander-in-chief, even if they disagree with some policies. 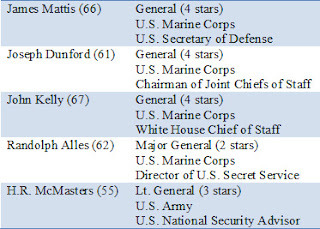 Marines, who have the smallest officer corps of the four major divisions, are holding key positions in the government’s foreign policy establishment and White House: Generals Mattis, Dunford, Kelly and Alles (Secret Service). H.R. McMaster is Army and operates the National Security Council. 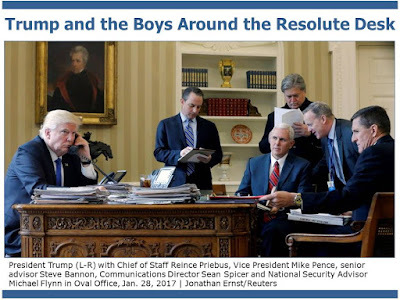 The Corps had serious reservations with Barack Obama’s risk avoidance foreign policy characterized by withdrawal from Iraq and Afghanistan and little involvement in Syria. In Trump’s administration, there is a potential for conflict with the nationalist camp. The Corps (and the Army) believes the peace and prosperity of America depends on the order established by the United States since the Second World War. The threats they see today will not be addressed by any form of nationalistic isolation. The August 2017 congressional recess feels like the history-making 2009 recess. In that year, the Tea Party got its start going to congressional town halls and offices to express their supreme dislike of the early drafts of Obamacare. Although Obamacare didn’t pass Congress until the next March, the movement had momentum and Democrats began to recognize they were in trouble. They lost two governorships in November 2009, Ted Kennedy’s open Senate seat, and then in November 2010, a record-breaking 63 House seats. Republican congresspersons are in trouble from disappointed conservatives who wanted Obamacare repealed. In addition, the high profile collapse of the bill damaged Republicans with voters who actually depend on Obamacare insurance. Possibly most importantly, their agenda has lost credibility and their rationale for having control of the government to get things done is no longer believable. Gridlock is back. Off-year elections are typically difficult for the presidential party and can be a disaster in the first term if presidents are in trouble. Bill Clinton and Barack Obama had terrible first midterm elections. Clinton lost the House for the first time in 40 years and Obama lost it back to the Republicans after holding it for only four years. 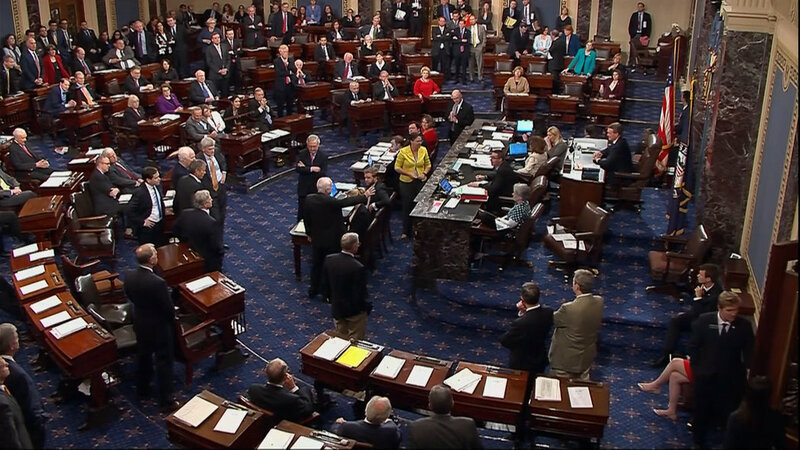 John McCain voted 2:00 am Friday morning, July 28, at the end of a late night Senate session that decided the fate of the repeal of Obamacare. McCain voted no, joining two colleagues, and stopped the Republicans’ plan for repeal. This was part of an on-air interview with Kim Christiansen. 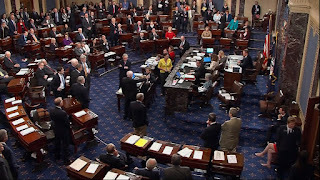 McCain demonstrated the power of a single senator from a small state taking on his party establishment and president. His vote, which saved Obamacare for the time-being, was ironic. McCain was beaten by Barack Obama in the 2008 presidential election, and now he was saving Obama’s legacy legislation. The closeness of the vote was not surprising from a historical sense. Obama barely received the 60 votes he needed in the Senate back in 2010, and it only passed with one vote to spare on the House floor in final passage in 2011. Indeed, this bill struggled since its filing this year, first in the House and then in the Senate. A vote had to be postponed over the Fourth of July recess for a lack of a majority. Although McCain was hailed in many quarters as a hero for stopping an unpopular bill, many of his Republican colleagues criticized him for contributing to the problem of “getting nothing done,” which he complained about in his epic Tuesday afternoon speech after dramatically returning to the Senate from his cancer treatment. Regardless of the reasons, the bill’s loss was historic and could have fateful consequences for Republicans. Seldom has party leadership brought a bill to the floor without knowing the vote. The loss damages the party’s reputation as being effective and it derails its momentum. One aspect of McCain’s action was a help for the party. The bill’s repeal aspect was extremely unpopular with some people, but the replacement parts were nearly universally disliked. Also, three-quarters of the public said they would like to try McCain’s bipartisan effort to pass health care. Senator Cory Gardner, a member of the Senate Republican leadership, voted for all three failed health care bills. None of them were very popular as replacements for Obamacare. Hence, he suffers both from the failure to deliver on the promise to repeal Obamacare and the anger of people who disliked its replacements. 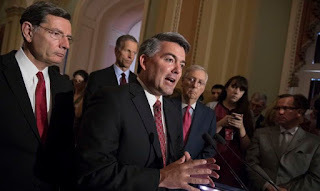 Gardner also had a myriad of pro-Obamacare (or pro-medical subsidies in general) voters that wanted attention at his office and at meetings around the state during the last months of deliberations. He got in trouble with the Denver Post, which endorsed him in 2014, for avoiding some constituents and for not taking a position on the bills. As a senator in a swing state, he was never going to find a popular position on repeal and replacement of Obamacare. Polling shows more than 80 percent of Republican voters want it repealed, but as Obamacare became more subject to repeal, it became more popular with the general population. Gardner is not up until 2020 (the Trump re-election year), but his reputation for thoughtful, somewhat independent and candid positions has been damaged. Like his colleagues, he’s now trying to determine what’s next. It is not apparent how the major divisions in the party come together in a strategy. 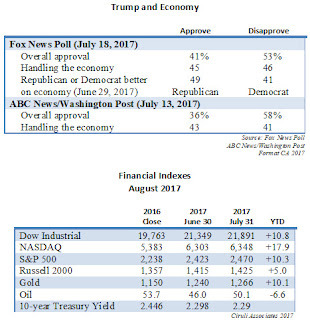 The Dow has hit four 1,000-point records since Donald Trump’s election nine months ago, but on August 2, the day it crossed its latest record (22,000), the President’s approval rating hit a new low –33 percent (Quinnipiac). Trump often rails that the media does not give him enough credit for the markets. In fact, he was frequently mentioned as having unleashed pent up optimism from investors and businesses based on his having a pro-business cabinet and agenda. But as the agenda bogged down in Washington, his contribution got less notice, and more credit now goes to good earnings reports, low interest rates and a reasonably calm world economy. An economic recovery going into its 9th year is also a driver. 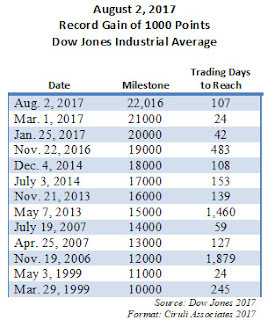 The latest 1,000-point record represents an 11 percent increase for the year and a 20 percent increase since the election (183 trading days). In spite of the dysfunction in Washington, the market continues to surge, hitting its latest increase in a mere 107 days. Trump’s approval rating, however, has been moving in the opposite direction, with the latest polls placing it in the mid 30-point range. His approval (using RealClearPolitics average) – never high – is 8 points lower at about the same time the market is 10 points higher. 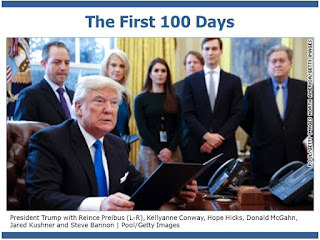 The White House has been the stage set that Donald Trump has used to star in the first seven months of the show – “Trump.” The personalities and production has led to some riveting moments, but a poor performing government. As the President’s poll numbers collapse, he finally recognizes his problem and brought in a director. 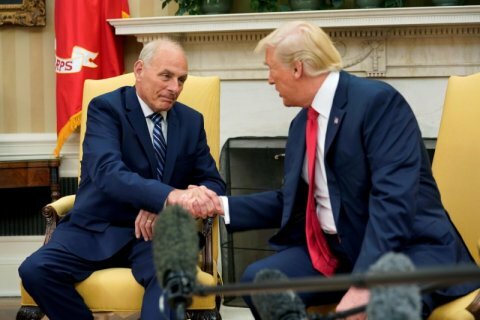 He made John Kelly, Secretary of Department of Homeland Security, the new Chief of Staff. Flat decision process. There is no chain of command. Trump is the star, he decides. 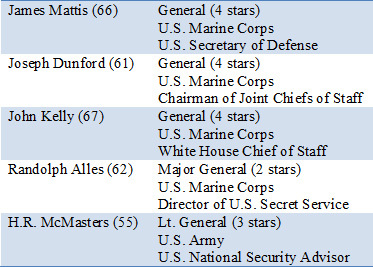 Chief of Staff Preibus has some staff, but clearly he doesn’t control access or the agenda. Centers of conflict. There are numerous power centers defending turf and viewpoints. Competition between nationalist Steve Bannon vs. globalist Jared Kushner is the highest profile conflict, but Preibus has his turf, Kellyanne Conway has hers. Stay close to the desk. Trump is a mercurial man who tends toward the provocative and the impulsive. If you want to defend a position, an initiative or a space, stay close to his desk. The last person who talks to him often has the most influence. Incessant tweeting. Add to that May 5th list the incessant tweeting of policies, personnel changes, insults, exhortation and random ruminations and it makes for a difficult management job. Kelly clearly has a challenge, but the show desperately needs a strong director. Kelly should just remember the first rule of the job is don’t upstage the star. Unfortunately, the second may be don’t inhibit the star’s access to his fans or to expressing his true feelings. The public’s view on the positive contributions of higher education to the “way things are going in the country” has declined in the last seven years. Republicans in particular have turned negative on colleges’ and universities’ contributions to the country. The public’s opinion of colleges’ and universities’ positive contributions has declined from 61 percent in 2010 to 55 percent this year. Much of the decline began in 2015. The public’s negative views increased 8 points during the last 2 years. The data was reported from a Pew Research poll released July 10, 2017. The poll was conducted with 2,504 adults from June 8-18, 2017. Partisanship is a major factor in the decrease in support for colleges and universities. There is a 36 percentage point difference between Democrat and Republican viewpoints on the positive contribution of colleges and universities to the country. Only 36 percent of Republicans have a positive view of colleges and universities, compared to a 72 percent positive view by Democrats. Few Democrats (19%) take a negative view, but a majority of Republicans (58%) do. Partisan differences increased since 2015. Republicans’ positive viewpoints went into a steep decline starting in 2015, with support dropping 18 points in the last two years from 54 percent to 36 percent today. News organizations have reported numerous stories with a negative slant toward higher education in recent years. The high cost of college, student debt loads and low graduation rates have been well covered. Recently, and of more interest to Republicans, have been stories frequently reported in conservative news sites of campus disruptions, takeovers of administrator’s offices, student protests of conservative speakers and an assertion of weak faculty and administrative responses. And, of course, conservative commentators often point out college communities’ consistent voting majorities for Democratic politicians. Although there has been a recent decline in the positive ratings of colleges’ and universities’ contributions to the country, Pew reports that at 55 percent positive ratings, colleges and universities are still above a host of other institutions tested. Churches are slightly ahead at 59 percent, but labor unions (47%), banks (39%) and the news media (28%) are behind colleges and universities. The reputation of colleges and universities is still high, but they face a host of challenging issues. The perception of higher education’s contribution to the country is important to its reputation and effectiveness, and although the recent decline is understandable, the key underlying issues need to be addressed. As of now, few national political forecasters suggest the Republicans will lose the House or suffer losses in the Senate, but current indicators and history suggest if Congress and President Trump don’t improve their performances, it could be grim in 2018. Presidents’ reputations tend to dominate mid-term elections and the first mid-term is historically difficult. In 1982, President Ronald Reagan lost 26 Republican members. 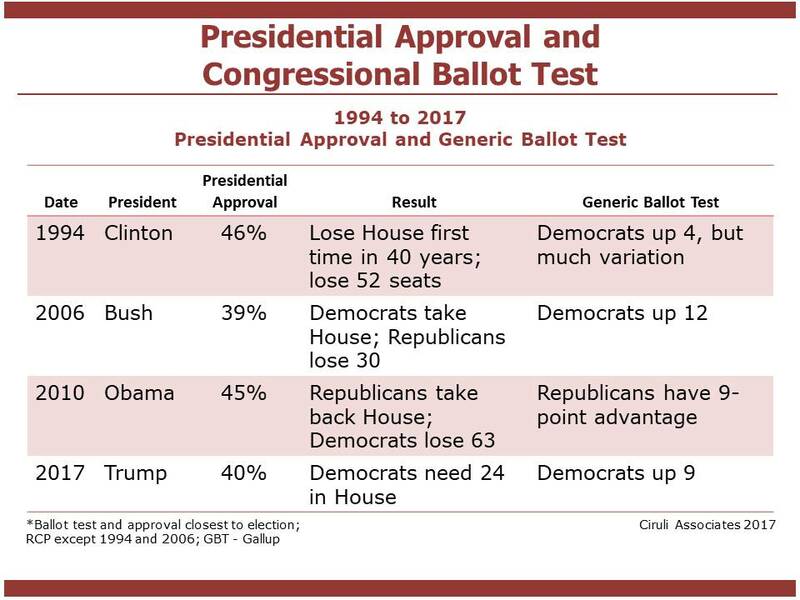 In 1992, President Bill Clinton lost 52 Democratic members and the House, and in 2010 President Barack Obama lost 63 members along with the House. 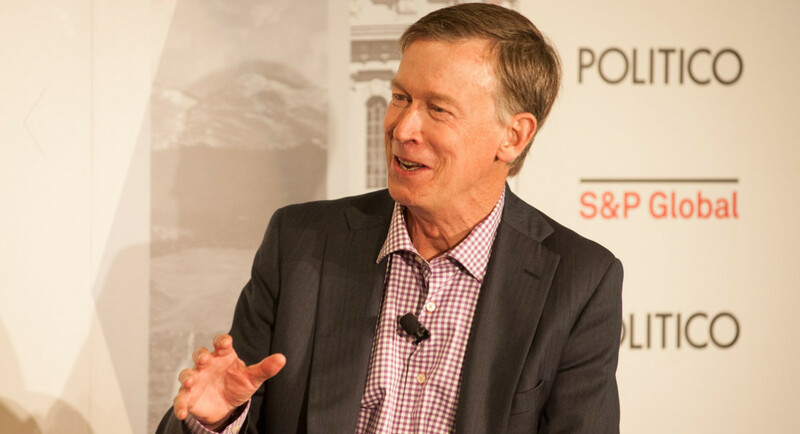 Hickenlooper for President? With Kasich? In a recent interview, Gov. John Hickenlooper was asked about his next job. He made clear Washington is a focus of his attention. Hickenlooper also confirmed most Colorado political observers’ views: Sen. Cory Gardner was damaged by the health care debacle. Hickenlooper said he was “disappointed” with Gardner and wouldn’t rule out a run for the senate in 2020. Thirty days after the end of a mostly positive first half of the year, the stock market continues to break records. The Dow was up 542 points for the month, ending at 10.8 higher year-to-date. The NASDAQ and the S&P 500 both hit record highs. Earnings have been positive and the Federal Reserve is holding steady, projecting some, but rather restrained tightening. The underlying economy continues to show improvement, but a few indicators, such as retail sales and consumer sentiment, flattened. One factor expected to negatively affect the economy and the market was the gridlock in Washington, but it hasn’t happened yet. In fact, one of President Trump’s best indicators is the public’s view he’s working on jobs and the economy. Trump and Republicans in general get their highest approval ratings dealing with the economy. The original group that gathered around the Resolute Desk at the end of the first heady week has been decimated – General Flynn was first to go, next Sean Spicer and finally Reince Priebus. Vice President Pence has a secure job, and Steve Bannon appears a survivor. General Kelly’s first recommendation as Chief of Staff is being unanimously well-received. He removed the President’s most recent personal hire – Anthony Scaramucci (July 21 to July 31). Is Trump Losing Drudge and Rasmussen? On Friday, July 28, Drudge, a powerful ally of Donald Trump, posted Rasmussen Reports’ latest Trump approval number – 41 percent (it dropped over the weekend to 39%). 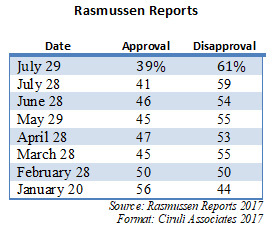 That represents a historic low for Rasmussen, which, due to its sample selection technique, has approval numbers several points more positive for Trump than the average approval maintained by RealClearPolitics.com. Trump usually cites Rasmussen and criticizes all other polls as fake news. But even more startling than the poll is it was posted by Drudge. A frequent guest at the White House, rumor has it he’s disappointed by the lack of progress on several fronts. Expect Trump and his team to become even more solicitous of Drudge concerns. What Trump and Republicans should be most concerned about is that not only is Trump’s average approval by most polls now below 40 percent, but even his favorite pollster has him collapsing from 56 to 41 percent since the inaugural.